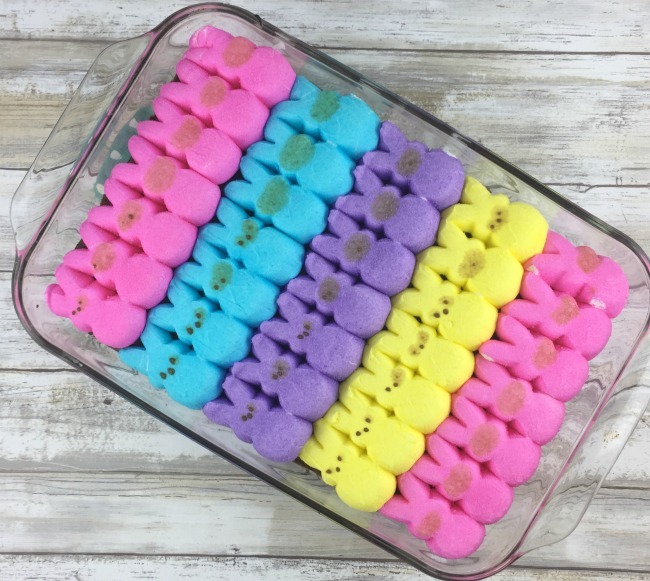 With Spring upon us, colors are returning to the outdoors, and even in stores, you find candies and peeps full of bright colors! 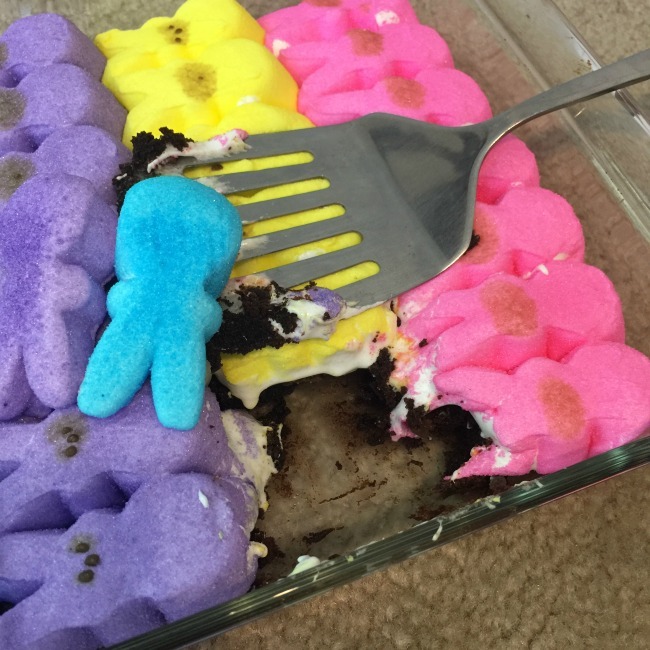 As we get ready for Easter I started thinking of all the tasty desserts that can be made with Peeps. At the top of my list to try was definitely Brownies! 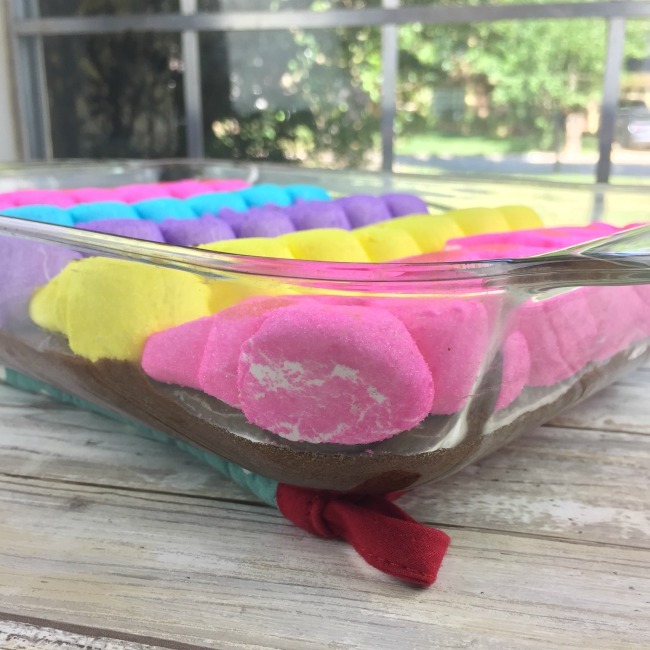 Figuring out how to combine one of my favorite desserts (brownies) with the popular Spring favorite (Peeps) was a challenge were were 100% prepared for. Back in the day I used to be KNOWN for my epic brownies. I used a recipe from this cookbook, but these days I don’t have as much time to make them from scratch. Now, I totally take the easy route with a brownie mix like this. Protip: You can make any brownies 10x better by adding a cup of chocolate chips to the mix. 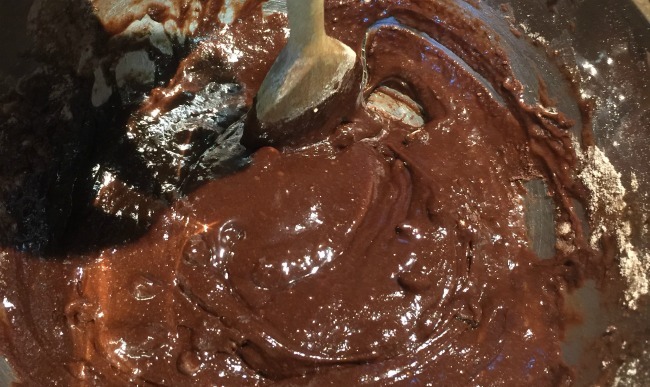 Lots of mixes have chocolate chunks in them these days, so look for those OR add in a cup of chocolate chips on your own as the last step before you pour the mix into the baking dish. Start with your favorite recipe or box mix. Bake the brownies until they are JUST done. Immediately pull them out of the oven. 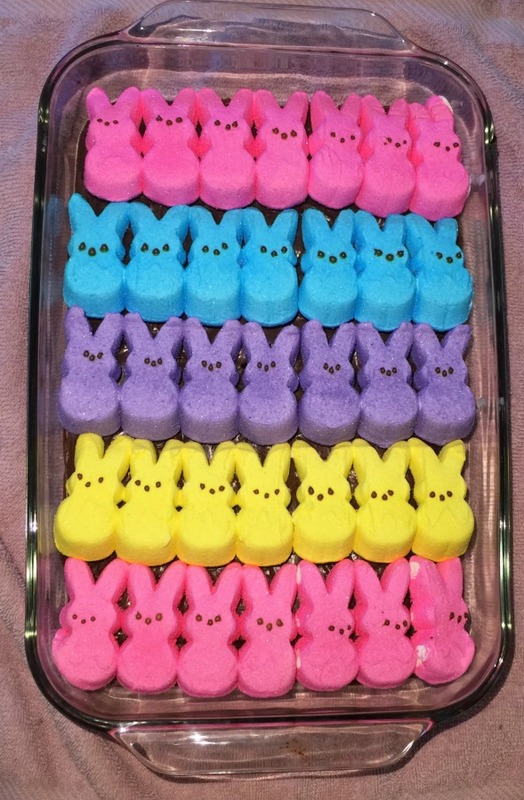 Make rows of peeps on top of the brownies alternating colors. I like getting packages of bunny peeps in various sizes like this four pack. 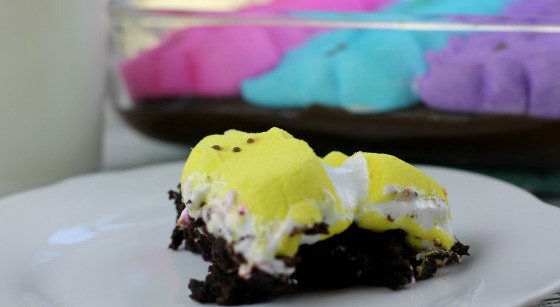 Place the brownies and peeps back in the oven for 1-2 minutes so the peeps get gooey and soft. The eyes and mouths on the bunnies will likely melt. Be ready to serve these right away so they are nice and gooey on top! 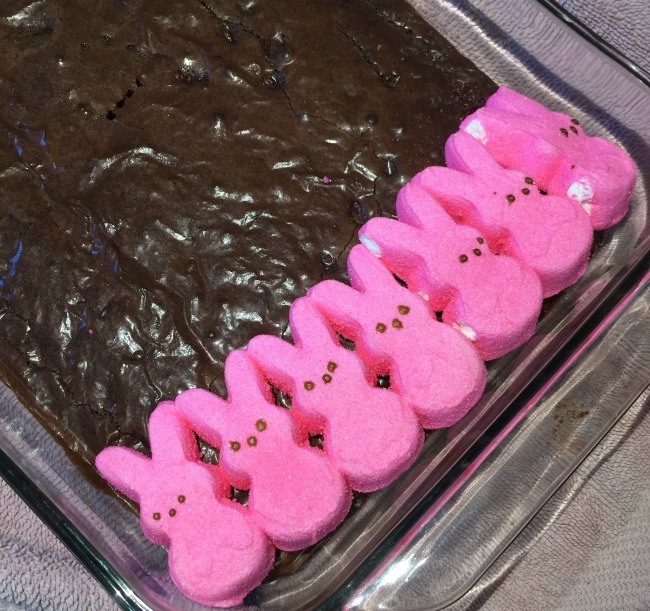 These were a huge hit at our house… though beware you won’t want to stop eating them! You can alternate two colors or use all four colors like we did! They will be gooey and delicious either way! 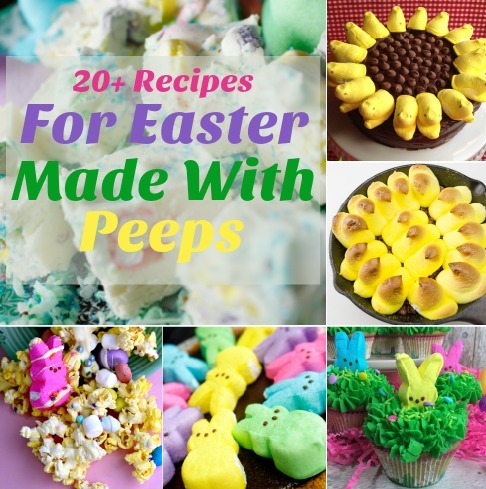 If you are looking for more Easter recipes made with peeps check out the round up we did by clicking the image below.